Sawatdikap! 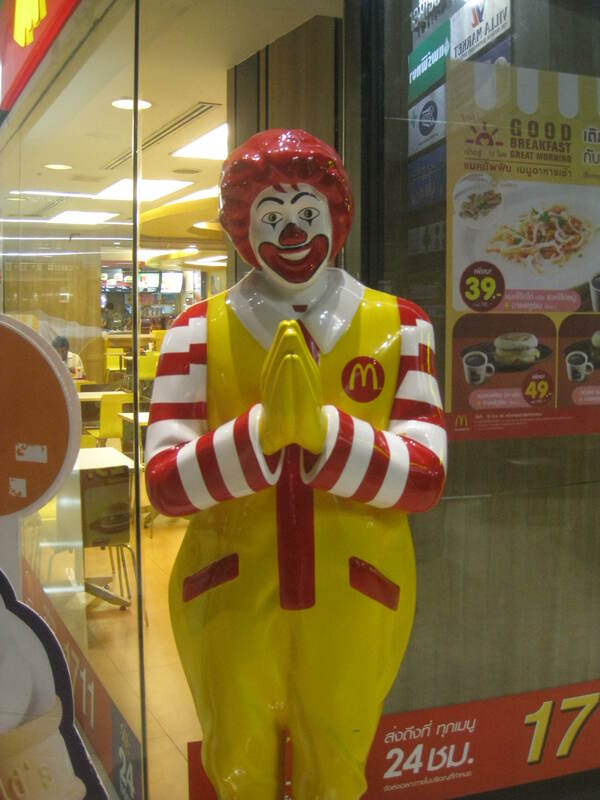 Ronald McDonald goes Thai. Since my last post it feels as though our adventures have been on fast forward: we have become certified scuba divers in the Great Barrier Reef, watched baby crocodiles sunning themselves under the watchful eye of their mothers on the banks of the Daintree River in northern Queensland, driven around the southwestern part of Western Australia in a campervan, lounged at the hotel pool bar making friends with the local bartenders in Bali, eaten our way through the food hawker centers of Singapore, met up with our friend Ramon and managed not to get flattened by a moto or two on the streets of Ho Chi Minh City, explored The Killing Fields and paid our respects to the thousands of men women and children who died there outside Phnom Penh, and huffed and puffed our way up narrow steps to the top of Angkor Wat temple near Siem Reap. Along the way we crossed a milestone: one year on The Grand Tour. One year! April 12, 2011 was the day we left the United States for London to begin The Tour and we haven’t looked back since. Well, there was that little kerfuffle at the UK Immigration Checkpoint in Paris which changed our plans, but other than that things have been peachy. 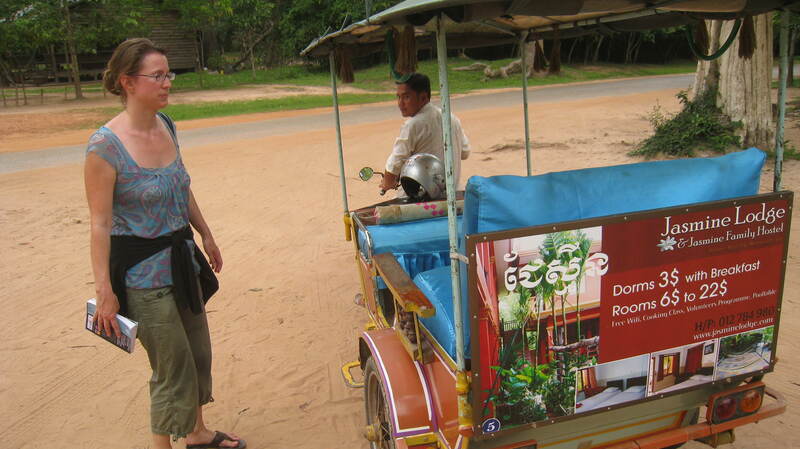 To get to all of these places we have taken planes, trains, automobiles, campervans, busses, minivans and tuk tuks. Two of these modes of transport were new experiences for us. 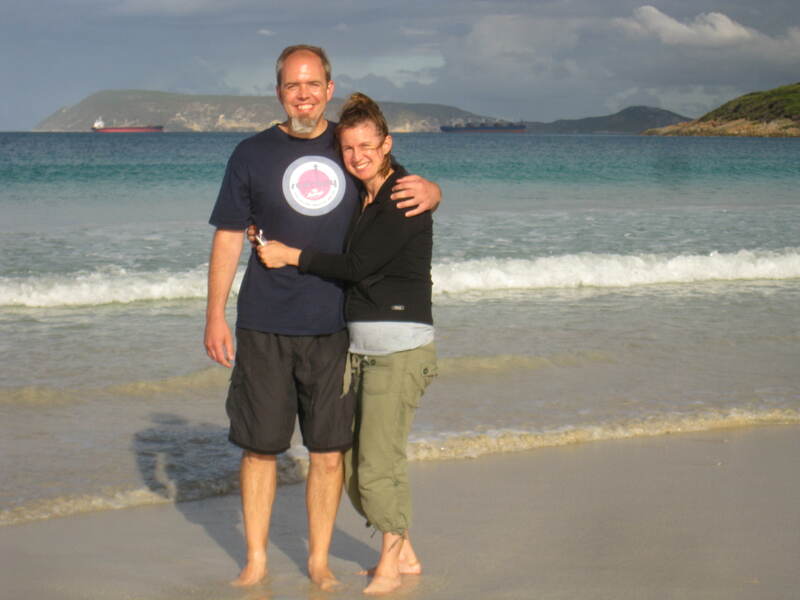 Traveling via campervan was something we had never done before and it was quite a thrill bringing our living room, bedroom and kitchen with us at all stops we made in Western Australia. The caravan parks at which we decided to lay our heads each night varied in every category you can think of. Some were pristine, reminding me of meticulously manicured golf courses dotted with tall and pungent eucalyptus trees. One was at the pretty Middleton Beach in Albany, a beach with soft white sands to sift through your toes and plenty of colorful shells to admire and collect. Another was just outside of Perth in the Swan Valley, an area famous for its great wine and spectacular beer (Feral, Elmar’s and Mash were outstanding and demonstrate that the best beer in Australia is produced in Western Australia. Sorry Melbourne, I know you like to claim the craft beer crown) but not as well-known for possessing the oddest caravan park, one that can I only say was inhabited by mole people and where most everyone seemed to be wearing plaid. 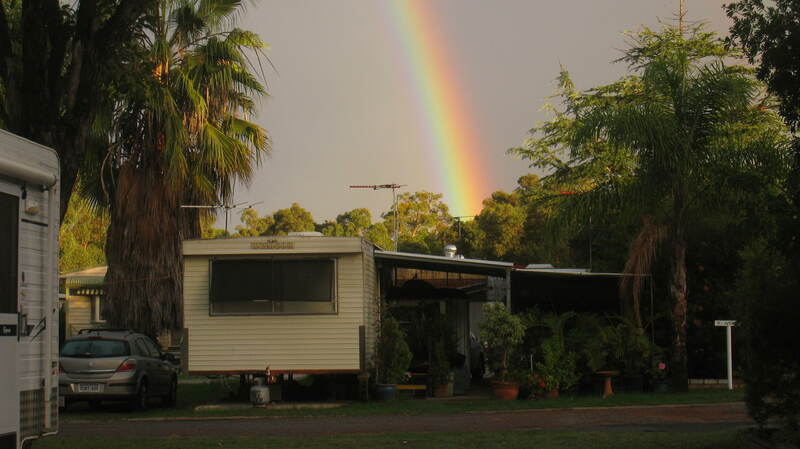 Rainbow at the mole-people-in-plaid caravan park, Swan Valley, WA. The nicest thing about this park was this rainbow. And that it was cheap. Steve/Emma: Hello! 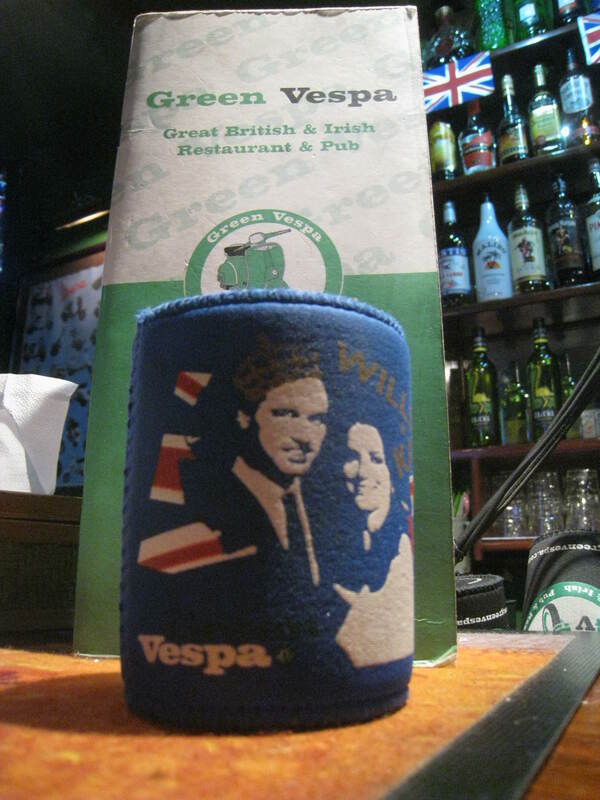 We would like to go to The Green Vespa at 95 Sisowath Quay. Near the river. Tuk Tuk Driver: The Green Vespa? Near the river? Ooohhh, very far. Very far. 3 dollars. S/E: What? 3 dollars? That’s crazy! Too high, too high. 50 cents. Tuk Tuk Driver: 50 cents? Ooohhh, so low. So low. The Green Vespa is very far. 2 dollars 50. S/E: 2 dollars 50? We know it costs $1. Thank you. We’ll find another driver. Tuk Tuk Driver: Uhhhh, 2 dollars. I take you 2 dollars. River very far. Tuk Tuk Driver: Ok! $1.50! Let’s go! S/E: Great! Let’s go! We have drinks waiting for us! And so we paid a price that was fair for both of us. On the surface $3.00 for a ride in a city is nothing compared to what you pay in the US – the drop rate for most cabs is around $3.00 – and these people are poor and work very hard to make a living. I am sure many tourists would pay the $3.00 without hesitation, thinking that $3.00 is nothing to them and it would be a boon to the poor person driving around on the dirty dusty streets. But then they would not be participating in a cultural ritual which can be both fun and frustrating. And more importantly, they would be taken for a sucker, which you definitely don’t want to do in these countries. 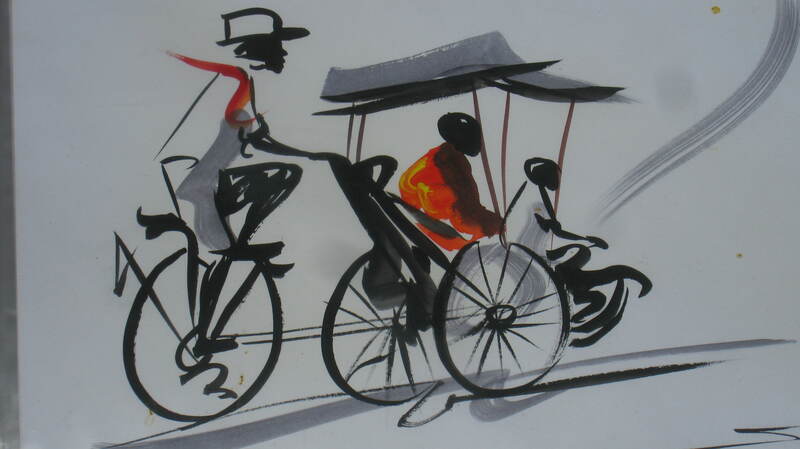 Apart from pushy tuk tuk drivers, aggressive street vendors and aggressively determined beggar children (one kid, about six or seven years old, on Pub Street in Siem Reap grabbed my arm and told me he needed money to buy milk. After I told him I would go to the store to buy the milk for him, he said “No, I will buy it. I just need the money. You give me the money.”) we have had to deal with the rain. As we are at the beginning of the rainy season in SE Asia we have seen just how this part of the world experiences Mother Nature and her capacity to flood urban and rural areas alike. It is rain as you have never seen it. Rain that at times is a violent and howling beast, often appearing without warning, slashing at you from all angles, with no regard for who you are, what you are doing, or whether you have expertly coiffed your own hair with expensive volumizers and delft movements of the hotel-provided hair dryer (Note: don’t even try to do your hair in SE Asia. If the rain doesn’t destroy it, the heat will.) After 20 to 30 minutes of deluge it stops, perhaps returning to do the same thing later in the day, but more likely waiting to roar again at roughly the same time the following day. 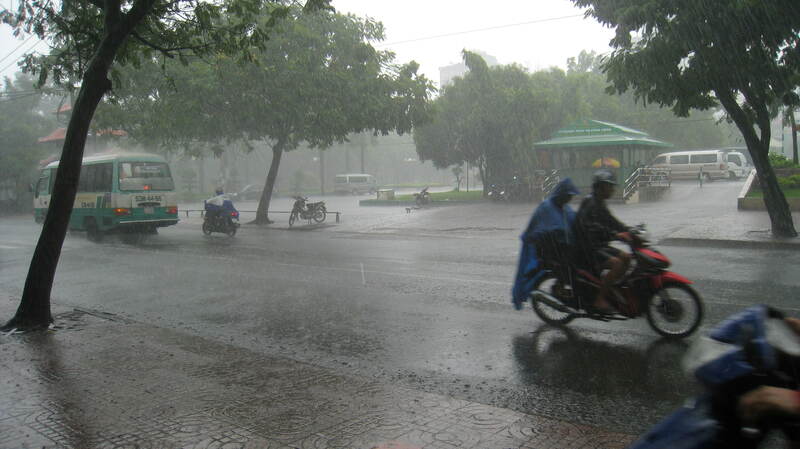 In Vietnam people carry umbrellas to shield themselves from the sun, not from the rain, as umbrellas are useless under its might. Rain ponchos are what they arm themselves with if they must be out, otherwise they simply take shelter under the nearest awning, canopy or door frame and wait for it to stop. SE Asia has been full of new experiences and we have welcomed all of them. We have welcomed the heat, and the torrential rains that bring some relief in temperature. We have welcomed the traffic and the realization that on the roads big comes before small and pedestrians do not have the right of way. We have welcomed the fact that sidewalks are not for walking but a place for food carts to sit, motorcycles to be parked and dogs to sleep. We have welcomed the temple, the pagoda, the incense, the jasmine and the marigold. We have welcomed stinking canals, dusty roads, the muddy old river and reclining Buddha. We have welcomed being the londo, the ba lô, the farang. And we have welcomed the spider. The fried kind, served on a bed of lettuce with a spicy sweet dipping sauce. So now I want to take Roger and the kid and just travel around the world. Sigh… I love reading your updates – keep it up! Wonderful! Asia sounds gloriously exhilarating and exhausting all at once. Such an experience. Mole people? In plaid??? 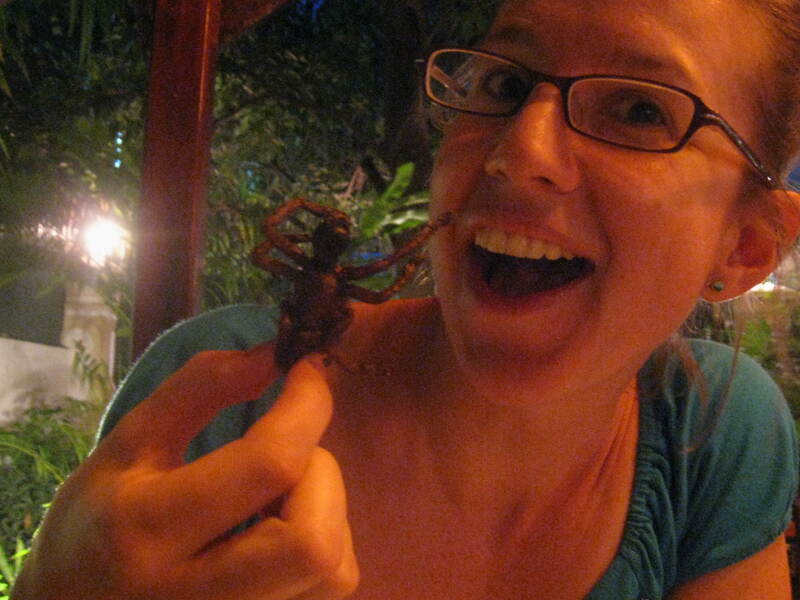 BTW, I love how you wrapped up your blog entry with fried spiders. 🙂 Great as always. « The Grand Tour: G’Day Australia!